Savvy Spending: How To Take Your Own Passport Photos (and SAVE lots of money)! 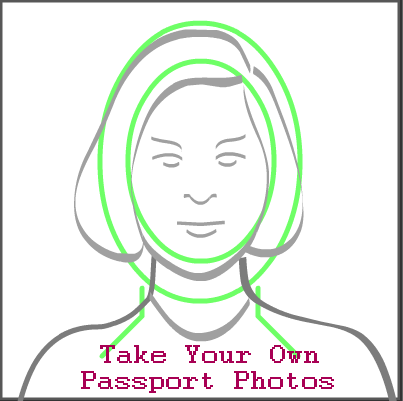 How To Take Your Own Passport Photos (and SAVE lots of money)! Here is a Re-Post from last year ... just in case anyone is going away and needs to get passport photos! You don't have to spend lots of money on the photos-- you can do it yourself! A few years ago our family took our first time out of the country (not including Canada, where we use birth certificates and our enhanced drivers licenses to cross), so we needed to get Passports. For five people. That alone was a pretty penny, people. When it came time to get our photos taken, I was NOT about to shell out another $50 to $75 for passport photos taken at a drug store. So I looked into taking our own. It turns out, this is totally allowed and the photos we took at home (for pennies!) were approved and our passports were issued with no problems! Have someone take a few pictures of you (it takes a few to get right size, distance, angle, etc). Make sure you are in a well lighted area and against a white backdrop (we used our front door). Then go to the Photo Composition Template and upload your picture. Adjust to the size needed (it's really easy and they provide directions). Save the photo, print it yourself and take it to your passport appointment!